Hailed as one of the best books of 2009 by the New York Times and the Los Angeles Times, this vibrant portrait of 1930s culture masterfully explores the anxiety and hope, the despair and surprising optimism of distressed Americans during the Great Depression. Morris Dickstein, whom Norman Mailer called "one of our best and most distinguished critics of American literature," has brought together a staggering range of material-from epic Dust Bowl migrations to zany screwball comedies, elegant dance musicals, wildly popular swing bands, and streamlined Deco designs. Exploding the myth that Depression culture was merely escapist, Dickstein concentrates on the dynamic energy of the arts, and the resulting lift they gave to the nation's morale. 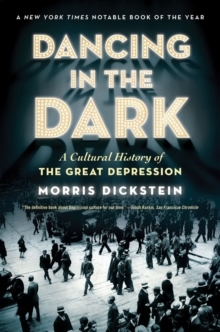 A fresh and exhilarating analysis of one of America's most remarkable artistic periods, with Dancing in the Dark Dickstein delivers a monumental critique. A New York Times Notable Book, Los Angeles Times Favorite Book, San Francisco Chronicle Best Book of 2009, and Huffington Post Best Book.